The new educational attainment data enable more accurate tallies of the size of the nation’s high school dropout population. 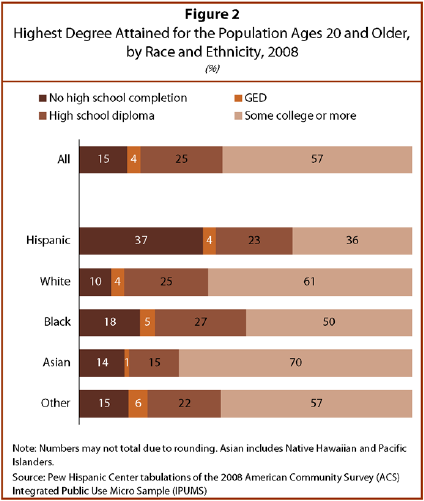 Previously, adults who ended their education with a GED were not distinguishable from those with regular high school diplomas, and the high school dropout population was therefore underestimated. In 2008, about 41 million adults ages 20 and older, or 18% of that age group, had not obtained at least a high school diploma(Figure 2). The number of adults lacking a high school diploma or more education would be underestimated by 9 million adults if those whose highest education is a GED were tallied as high school graduates with a regular diploma, and the dropout rate would be 15% rather than 18%. In comparison with the 41% of Hispanics adults ages 20 and older who were high school dropouts, 23% of black adults had not attained at least a high school diploma. 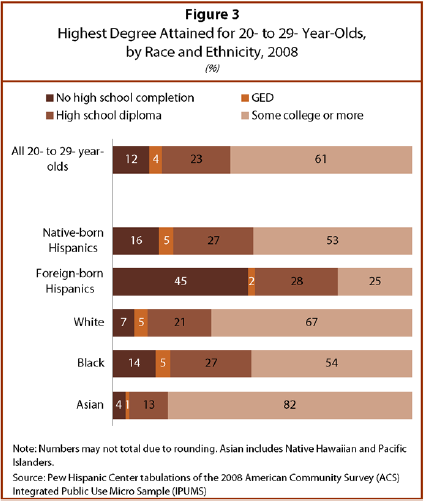 White adults (14%) and adults of Asian origin (15%) were less likely to be high school dropouts. The outcomes of young adults are of particular interest because they reflect the recent performance of the education system. In 2008, about one-third of Hispanic 20- to 29-year-olds were high school dropouts. However, some of the Hispanic 20- to 29-year-olds were immigrants who arrived in the U.S. during adulthood and never enrolled in U.S. schools. Among native-born Hispanic 20- to 29-year-olds (who were educated in U.S. schools), 20% were high school dropouts (Figure 3). The dropout rates for 20- to 29-year-old whites (12%), blacks (19%) and Asians or Pacific Islanders (6%) were lower.